I had a wonderful time at the Discovery Cove. These are the things I did: swam with the dolphins, learning about the dolphins, fed the birds, learning about the birds, fed the mother shark through a tube, learning about the sharks, even patted the stingrays & learning about them, too. Thank you so much for honoring Patricia as the Hillary Fund recipient and giving her a wonderful life experience! 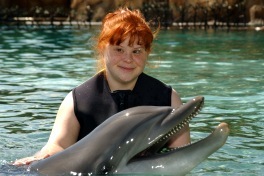 She truly loved “Rose”, the dolphin, the rays, birds, even the sharks (from afar). We all enjoyed our family time together. It was just great to get away, eat out and totally relax. Please know how much we appreciate your generous gift to all of us.